So yesterday, I mean Tuesday – was my mom’s birthday and I completely forgot to at least call her. Not really forget, mostly I remembered at the wrong time to actually pick up the phone and call. I mean, I did call on Sunday because she never called me like she does at 11am on Sunday mornings, so I humphed and fretted and broke down and dialed the phone (okay, pushed buttons) and when the call as answered it was not my mom but Carl telling me she had gone out shopping, the nerve of her, and when she called me back later she said Carl told her I was putting all the stuff she ever gave me into the dumpster so I said yes, yes I did. Then Tuesday came in a flurry of activity because I had to make it at least look like I got some work done in the morning, and we all had to be ready to leave at lunch time and go down south to the big city, drop off Ron at the doctor’s, do some shopping meet up with A & K for dinner, head on home again, check on clients and answer a few emails, then zip back into the local town and head on to the fair because it was Loonie Night (all rides $1) in the spitting rain and darkening skies, with the big lure for me being all the pretty lights to take pictures of, then to fall into bed exhausted, tossing and turning in the humidity, only to get up and seemingly do it all over again, the phone ringing the emails flying, client emergencies, digging around servers, and going to my happy place, keeping insanely busy on the anniversary of my grandmother’s death where we just try not to think of it really, and then I remember I still haven’t called my mother let alone blogged and I remember I have a couple links to pass on to her anyway and might as well post them so here you go. *whew* Yes, my days have been like that again. Again or still, I’m not sure. So! Happy Birthday Week to my mom, who took the whole week off and is probably headed to my house right now to see if we’re okay. Here’s a new blog I found that posts pictures and commentaries of cake disasters. I had to go read every single post, until I got to the one that started it all, which I know I sent my mom the link to when it hit the internet, and she had to call me and tell me how funny it was. Here’s to another year. Try not to pee while laughing. No, really it was, come back! The guy came early, like I just got back from my walk early, and his truck was a wee bigger than I thought it would be. I got him to leave the extremely large container right where Ron told me to tell him to put it. He kind of had to wrangle the truck a bit. And then? We noticed he had the lifter part of the truck caught on some overhead wires. Thankfully not connected to anything (I think) but wires nonetheless. So when he asked is he could borrow a shovel or stick or something to move the wires, well of course I said “OF COURSE!” and frantically looked around helplessly. The guy and I had just finished saying to each other that neither one of us has any caffeine yet that morning either. So that’s why I got to move the lever on the truck, see, because he was up under the back part that lifts, holding the wire up out of the way, and he couldn’t reach the levers on the side of the truck, so he showed me which one to pull to bring the level back down. All while he stood ther with it coming slowly towards him and both of us watching to make sure the wire got out of the way. After that I was pretty much awake. Today after my morning walk, I wandered around to look at the dumpster (it has a door) and saw MRS gopher runnign under it. I say MRS gopher as babies have been spotted. We loved the Wall-E movie, even knowing after the DVD comes out, we’ll probably hear & see it 2566501765 times. Even if people have objections (some quite venomous) and (admittedly valid) concerns over the associated products to consume. But this story, this one irght here? This is why we love Pixar as a company. Someday Emma hopes to work there, and even if she just gets to visit, like the girl above did, that will be the bestest thing ever. Today so far, Emma has made a hampsterscope, otherwise known as a phenakistoscope but much easier to say. 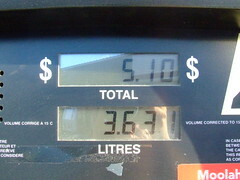 And coincidentally, 3.63 liters is almost one US gallon, which is 3.785 liters. (okay, a quarter-cup short.) It’s been around this rate for a month, I think. Other pics you might be interested in are Emma’s clean desk, her pizza she made, happy butter, a cute drawing, Meaghan’s hats.. oh heck, just go look will ya? Crap. Todd tagged me for a book meme. This will cause the user agent to pick a sans serif font family such as Helvetica and apply it to the BODY element. Thanks to inheritance, this will apply that font choice to the entire document (unless a more specific selector overrides it, of course.) The result is something like what’s shown in figure 5-1. From the O-Reilly text, Cascading Stylesheets – The Definitive Guide. Did you expect anything different?